The artichoke as you can see in the picture is a lot smaller then the typical artichoke. This dish can be made by using the larger ones, but the nice thing with the smaller ones is that there is less of the hair or prickly insides in the center. Don’t confuse these with the extremely small kind that come in a package of 10-12 artichokes, which are way too small to stuff. Serve as an appetizer or a side dish. 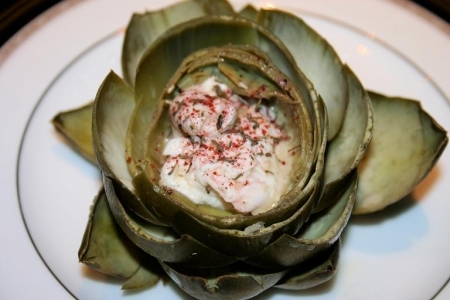 If you like this recipe try Baby Artichokes Stuffed with Israeli Couscous. Serves 4. In a medium sized baking dish bake fresh mozzarella at 375 degrees for 15 – 20 minutes until thoroughly melted. Remove cooked artichokes from Dutch oven or pot and remove center portion carefully with a spoon. These will not have as many hairs or rough parts as the large artichokes so remove it gently. Fill each artichoke with a generous dollop of melted cheese and sprinkle with a ½ teaspoon of zatar seasoning.